After lasts weeks loss with the running battle (read about it here), I am determined to get back on track this week. Success as a runner and in life requires overcoming challenges, time management, and determination. A lot of times this comes down to a little self-discpline. This was the theme at school last week and ever since, it has been on my mind. How do you teach teens (and adults for that matter) to be self-disciplined? That things you wait for can be more rewarding? That the little choices you make all the time can become the big choices? I tend to think that runners have a lot of self-discipline, but where exactly does that come from? While we learn a lot of our self-discipline by watching others who have this skill, there are always those who lack those role models in their life and go on to be resilient human beings. While I ponder these questions and thoughts, there is one thing I’m certain-running builds self-discipline that carries over even outside your running shoes. Last week was a testament to my temporary lack of self-discipline, however I think we are all allowed those weeks now and again. Having a bad week sometimes reminds me of why we do work hard for the things we want, sacrifice certain things in exchange for other things we want more, and find challenging tasks more rewarding than the easy. 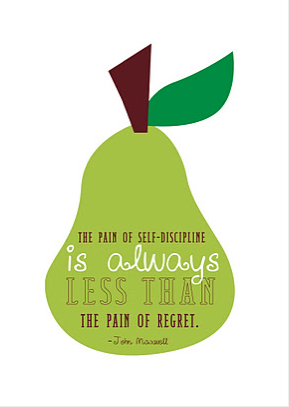 This week let’s be self-disciplined. Let’s work through the challenges of fitting miles into our calendar. Let’s push through the excuses so we might be proud of ourselves at weeks end. Stronger. More determined. Better able to face other challenges in our life. Let’s focus on what we want most, not what we want now. Closer to the goals we have that will be so sweet and rewarding to accomplish. 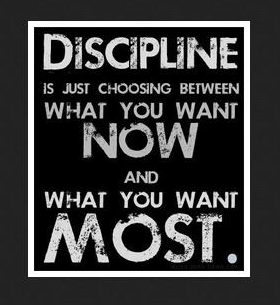 Bring on the self-discipline.